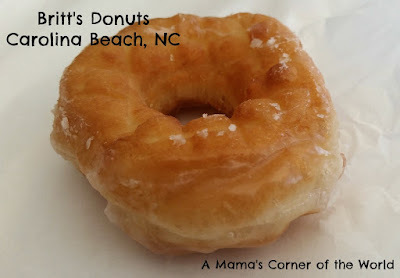 During a trip to Carolina Beach in North Carolina, we were told that we simply had to have a donut from Britt's Donuts on the Boardwalk. Britt's has been open for decades--serving their well known donuts to locals and tourists alike. 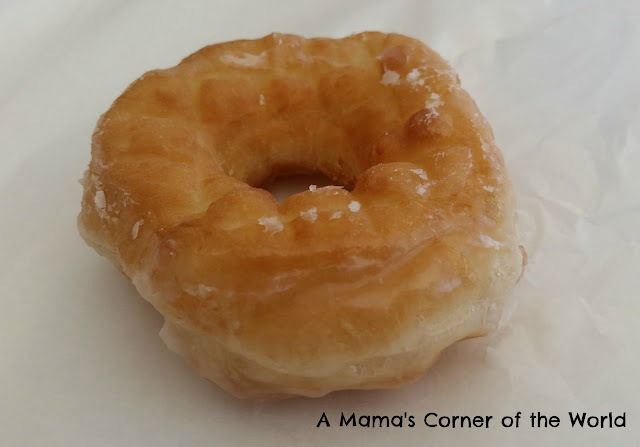 I thought I would share a couple of photos from Britt's Donuts as this week's Wordless Wednesday Link Up! Britt's is open only during the busy, beach season. 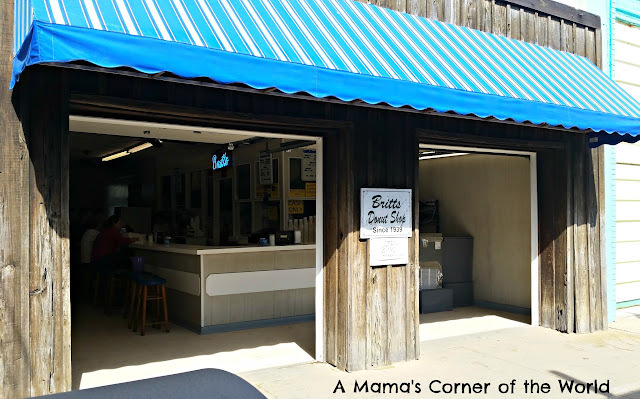 We visited just days after Britt's opened for the 2015 season--and were met with at least an hour wait both weekend days! With those lines, we knew that these donuts had to be worth the wait! We snapped this photo early on a weekday-- shortly after Britt's opened for the day. The stools inside were already filling up! Why aren't we showing a huge donut case with 80 varieties of donuts? Because Britt's serves one donut: a warm, homemade glazed donut. Cold milk and hot coffee are served in styrofoam cups for carrying--and Britt's only accepts cash for payment. What did we think of Britt's Donuts? This was probably the best glazed donut I've ever eaten. Would I stand in line for over an hour for one? Yes--I think I would! If you make it to Carolina Beach--you really do need to have a donut from Britt's. I think the appeal for us was that the donuts were warm and, since the shop is so extremely busy, extremely fresh from the fryer! Expect a line. In fact, if you see a massive line on the boardwalk--it is probably heading to Britt's! Have cash. They only accept cash--no credit cards! You don't want to stand in line for an hour or more only to find that you can't buy a donut! Buy more than one donut. You will want another--and you won't want to stand in line again! Britt's is only open seasonally. We were lucky enough that our off-season travels were close enough to the season that they had already opened! Okay...as always...my Wordless Wednesday began with good intentions...but, I can never keep my mouth shut! It's not as wordless as I had planned (again this week)--but, I'll try to do better next week! (even if they aren't really...um...totally Wordless! The girls love them in all shapes and flavors! I'll take a baker's dozen. Thanks! As we were leaving--both girls said that we should have picked up a lot more for the trip home! The girls inhaled theirs so fast! Crumbs and all! Great donuts they look delicious dripping with sweetness! I think it was the first warm, glazed donut the girls had ever had! A yummy piece of heaven right there! Thanks for joining OMHG Wordless Wednesday. MMMMMM, a good donut is hard to find. Looks yummy. These would be worth the wait! Wow looks so heavenly! Soft and sweet just the way I want my donuts! These were probably the freshest donuts the girls had ever tasted! They will never look at glazed donuts from the store the same again! They were certainly a big hit! Yum. Everyplace should have those kind of donuts. Here, it's Greenbush Bakery close to campus. We used to have a small, family owned bakery near my grandparents that was the best! It's awesome to find a really good bakery! My middle daughter is a donut-addict....and she even had to admit that this was a really good one! Never heard of Britt's. That donut looks mighty yummy. You know it's got to be good if people are willing to wait in line for it. Our first thought was.....an hour wait for a donut??? Then we realized why! Yum yum yum! Where's mine? They were! Thank you for stopping by! Visit them super early in the morning on a weekday! Every day we were there--the line was over an hour long from 12pm on! Wow, so it really tasted as good as everyone was saying? Now I want one! They were really good--especially warm! It was certainly worth the visit! I love finding places like that where they do one thing but do it really well. I will have to add this to our NC bucket list for our travels. Wow~! They must be worth it! Yummo! oh my... they surely made my mouth water! Thanks for shring at Snapshots of may!